As per my tradition every first day of December, I'm posting my Christmas wish list here just in case Santa's feeling generous. (^_−)☆ This list actually looks scant as compared to my lists from the previous years. I don't know, I guess it's because you want less as you turn older? Or maybe you just get realistic that you won't get everything in your list anyway? Hee. Anyway, these are the things that I don't really need, but I figured would make my life extra sweet. Meet and greet with Nate Ruess. Whoever can give me the chance to meet Nate Ruess in person before or after his Manila show on January, ohmygollygoodness I WILL LOVE YOU FOREVER. Typewriter. This has been a constant staple in my wish lists ever since I lost mine to a fire in our neighborhood back in 2011. I don't even know if they still manufacture the ribbons for typewriters, or maybe I can buy them in bulk somewhere? 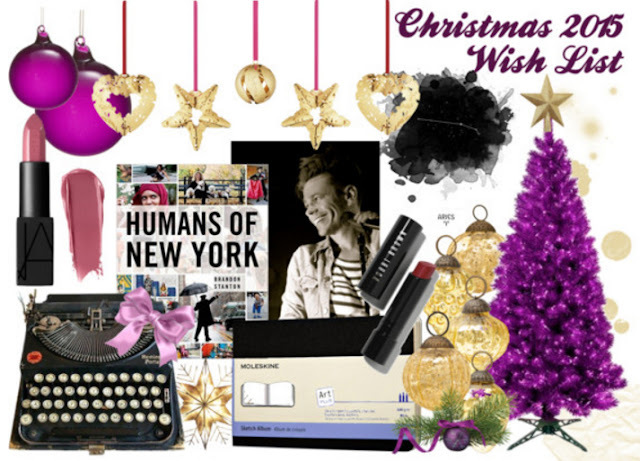 A typewriter under my tree will really make me happy. Moleskine Watercolor Journal. This is for when I go out of town. There have been instances when I wanted to bring my travel watercolor kit with me but I always end up not being able to do so because I find bringing loose leaves of 4"x6" and 6"x8" watercolor paper that I pre-cut too much of a hassle. Humans of New York. The entries of HONY on Facebook always makes me tear up, and I would love to have the book. NARS Audacious Lipstick in Anna and Bobbi Brown Creamy Matte Lip Color in Crushed Plum. Because a Krissyfied Wish List ain't complete without a lipstick in it. Astronomy-themed anything. A date in the Planetarium, a night of star-watching --- basically anything with stars. Hipster Jasmine Funko Pop! It's not in the photo because it's not available in the photo-editing website I am using so just kindly click the link to see how she looks like. If you don't want to, well, okay, hee. I want this because it's my favorite Disney princess AND she's wearing glasses. But, you know, I've been extra good this year so if Santa's feeling extra generous then I wouldn't complain with getting a new camera or a new apartment near the office either. Heh. What are the items in your Christmas wish list? I would love to know!